For the Thousandth Time, Get Rid of the EAS and WEA!! 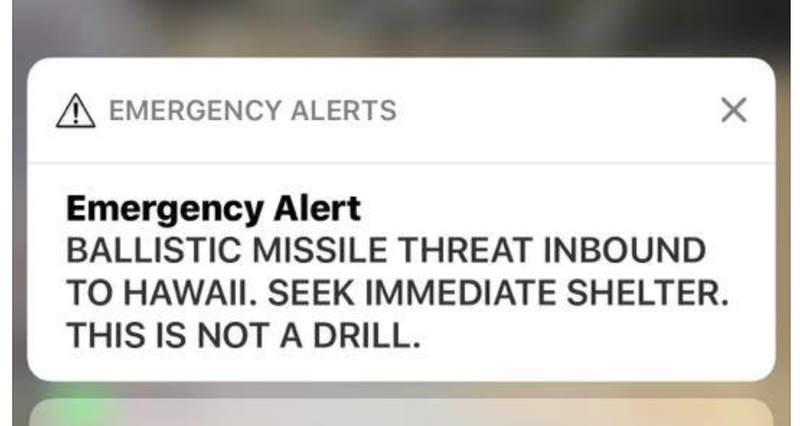 The above message was sent, via cell phone, to every smartphone in Hawaii -- resident or tourist-- this morning. It was in error. And, it took them 40 minutes to correct it. My instinct is that 30 of those minutes was spent getting their stories straight. The EAS is the obnoxious tone that interrupts your television and radio program with a weekly test. In markets like Wichita that is all it does. In Dallas, they play that silly tone before every tornado or severe thunderstorm warning -- which does nothing but slow down the dissemination of the essential information! An EAS test is below. The theory behind the EAS is so "emergency" information can be disseminated because -- get this -- the government is concerned that TV and radio will not carry it voluntarily. Consider: The EAS was not activated on September 11. Did you notice any problem with stations breaking in and providing coverage that terrible day? Of course not. In a bureaucracy, nothing succeeds like failure. So, after the September 11 fiasco, the government decided it needed WEA so they can send you incorrect information over your cell phone. There has been criticism in the media this past week that the WEA system is not widely used enough. The issue, as I see it, is there are just too many preventable false alarms. Unpreventable. A hook echo with rotation on radar and a tornado warning is issued but no tornado occurs. That is an unpreventable. The state-of-the-science is not advanced enough to prevent all false alarms. Preventable. This like today's when government officials are goofing off or not following the correct protocol. There are way too many preventable false alarms. 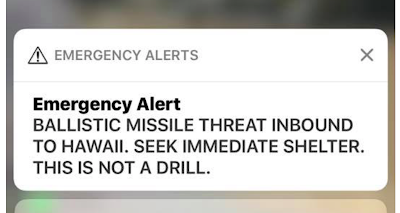 And, I am not aware of anyone getting fired for sending one of these out. The current warning system worked extremely well before WEA and without EAS. Get rid of them both. Note: It is a proper role of government to warn people of certain hazards. It is the commandeering of smartphones and other communication systems to which I am objecting along with the lack of accountability when these avoidable problems occur. Another addition: more on the WEA mess here. Second addition: A man had a fatal heart attack after "goodbye" call as a result of the false alarm. Story here.